The global money tsunami – massive flows of flight capital from the world’s hot spots to the world’s safest havens like the U.S. — is back in full force. In recent days, the spotlight was on Saudi Arabia’s de-facto ruler, Crown Prince Mohammed bin Salman (below). 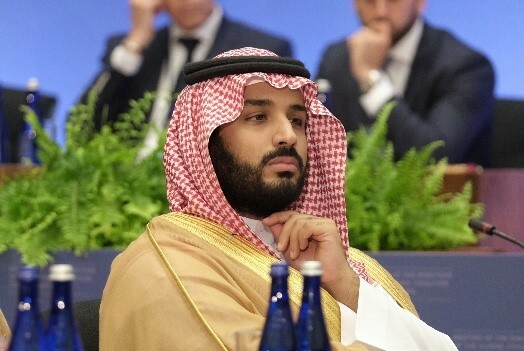 In the wake of the Jamal Khashoggi assassination, the Saudi stock market plunged, their currency crashed, and major institutional investors that the Crown Prince was courting ran for the hills. U.S. Treasury Secretary Steve Mnuchin, Jamie Dimon of JPMorgan, the bosses of Ford Motor Co. and Uber are just four of the many government and business leaders who have cancelled plans to attend the prince’s investment forum next week. The full details of the assassination are still coming to light but it’s clear that, for now at least, these Western leaders won’t touch Saudi Arabia with a 10-foot pole. Result: Big money is on the move! Investors are dumping Saudi assets and shifting to the one place they can find relative safety and plenty of liquidity: The U.S.
Over 7,000 miles to the East of Ryadh, we are witnessing a similar phenomenon in China. The Shanghai Composite Index recently hit a four-year low. The Chinese yuan is near a 10-year low. And now, China has shocked the world with a new report showing that its GDP growth is the worst since the 2009 debt crisis. The result: MORE flight capital rushing to the world’s most liquid market — yep, you guessed it: the U.S. This is what we said would happen, and it’s happening. Foreign investors fleeing turmoil and searching for a safe haven are NOT looking to buy risky stocks. They don’t want unknown, fly-by-night companies with nothing but tall promises. They’re buying strictly cream-of-the-crop companies with big profit potential AND relative safety. My advice: Stick with the best of the best. That’s PRECISELY the kind of company that gets our top Weiss Rating. And it’s the ONLY kind of stock we’re buying in my Weiss Ultimate Portfolio. By focusing exclusively on the TOP TEN stocks among the 10,000-plus that Weiss Ratings grades every day, it helps build your wealth with the strategy that could have handed you an 809 percent gain since 2007. That’s 4.2 times better than Buffett’s Berkshire Hathaway … FIVE times better than the S&P 500 … enough to multiply your money more than nine times over during a period that included the worst recession in U.S. history. For more info, see my latest report.